BOTTOM: The iconic Tse’ii’ahi, or Standing Rock, gives the local community its name. People told Tse'ii'ahi' Community School maintenance man Ronald Willeto not to bother trying to landscape the venerable school. "It's built on solid rock!" they said. "Nothing you plant will grow." But, with patience, Willeto was able to cultivate a soft green lawn and a row of petunias that bob their perky little heads at the naysayers. Similarly, it will take patience for this isolated chapter, built where the flat gray-brown plains east of U.S. 491 begin to fracture into rocky mesas, to develop. But whatever comes its way, Tse'ii'ahi has a rock-solid foundation of community to support it. "Whatever little money we get," said Chapter Vice President Velvet Kalleco, "we try to assist the people." In return, the people support the chapter, packing the chapter house for meetings, even planning meetings. Because the chapter has taken an interest in them, Kalleco said, they take an interest in the chapter. Recent projects include tapping into the El Paso Natural Gas pipeline so residents have the option of convenient, clean-burning fuel, and a solar application for an off-the-grid home. On tap: a renovation of the Head Start building, a sewer lagoon, bathroom additions and wiring for people who can't afford to connect to the electric line. The chapter tries to accommodate all its college students with scholarships. Most people know Tse'ii'ahi, "Standing Rock," for the stone pillar near the chapter compound that has been a landmark along what is now Navajo Route 9 since ancient times. "There are a lot of stories about it," said Kalleco, "but the people who knew them passed on before they told us about them." The odd double pillar, which you can see from the road, is still a focal point of the community, with the chapter compound, the school and formerly a trading post built around it. Both the chapter and school changed their names from Standing Rock to the Navajo version a few years back when a Bureau of Indian Education grant meant to replace the old school was mistakenly diverted to the Standing Rock Sioux Reservation in South Dakota. 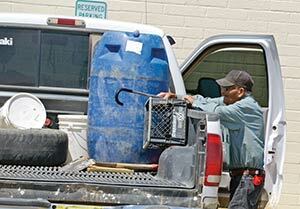 "We told them it was our money, but they wouldn't give it back," lamented Kalleco. Name: Originally "Standing Rock," the name was changed to the Navajo equivalent after a BIE grant meant for the Standing Rock Community School mistakenly went to the Standing Rock Sioux reservation in South Dakota. 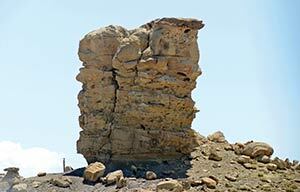 The name refers to a double pillar of stone you can see from Navajo Route 9. Land area: 74,104 acres. Population: 641. Major clans: A wide variety of clans is represented here, including some of the more obscure ones and some adopted clans. There is also a substantial number of mixed-race individuals. Famous sons and daughters: Former Indian National Finals Rodeo champion Ed Holyan, Code Talker Jack Morgan, Navajo Nation Fair manager and champion barrel racer Genevieve Tsouhlarkis. Assets: strong sense of community, historic BIE school, no gang activity or graffiti. The original school buildings, painstakingly built by local community members in 1935, are much more picturesque than the pre-fab units most of the classes are being held in now, but because the old buildings are on the National Register of Historic Places, they can't be upgraded to modern standards for classrooms. The main building is being used as a kitchen and cafeteria, Willeto said. The K-4 elementary school is the heart of the community as much as the chapter house. One of the oldest continuously operated BIA schools on the reservation, it has both employed and educated generations of locals. Willeto's sister Unabelle is the school's business technician, and their mother, 82-year-old Christine Willeto, worked there for 34 years as a dormitory attendant, instructional aide and bus driver. Although she doesn't quite remember the school being built Ñ she would have been 3 at the time Ñ Christine Willeto got her education there and can describe the school's early years. "Nobody had a chidi at the time," she said. "We all rode our horses or wagons to school. "Everybody stayed in the dorms, and you got to go home on the weekends." There was no electricity; students studied by kerosene lantern. A large hand-dug cave in the ground served as a root cellar, keeping vegetables fresh for the children. Although the student population then was about the same as it is now Ñ 90 children Ñ Willeto doesn't remember there being more than two teachers at any one time. They taught all the grades together, she said, and "you would see taaaall boys and girls" Ñ teens who, for various reasons, got a late start on their schooling. In some ways, life was more convenient then. You grew your own corn, squash and mutton, and could get anything else you needed from "Bony Woman" Ñ trader Lillian Burnham at the Standing Rock Trading Post. Asked how often people rode the 50 miles to Gallup, Willeto replied, "Never." Most of the teachers and principals who ended up in the small, remote school were there for the cultural experience, and Standing Rock was never one of those schools where teachers would make students wash their mouths out with soap for speaking Navajo. In fact, there was no objection when Willeto and the other Navajo dorm aides taught cultural lessons, like how to introduce yourself in Navajo, after hours. "Back then, there was nothing like overtime," said Willeto. "You worked until your job was done, even if you had to stay there all night. It wasn't like now when everybody says, 'I worked eight hours. I'm going home.'" The little school has attracted some characters over the years, including the principal who was also a pilot and built a little landing strip. "Some of the staff got to go up in the plane," recalled Willeto. "You looked down and you could see little tiny houses." Although much has changed since then, some things haven't. Weavers from all over the reservation still scavenge the plains of Tse'ii'ahi for the elusive wild carrot, rumex hymenosepalus, a natural dye. "They like it because you can get three different colors from it," explained Kalleco, whose mother was a weaver of some renown. "If you pick it young, you get a pale orange. If you wait until it matures, you get a dark orange. If you pick it when the leaves are dry, you get a deep brown." And there are still, said Kalleco and Unabelle Willeto, students who ride their horses to school. You can see a little corral behind the buildings where they contain them during the school day. Everyone knows how to sit a horse; this is rodeo country, probably because there's not that much else to do. The school has a thriving 4-H Club. Willeto's son Fleming proudly shows off his nieces' and nephews' prize sheep and chickens, gifting the reporter a basket full of lovely fresh eggs. There are advantages to the isolation. Without easy access to a town, people improvise and make do. Fleming shows off little workbenches with metal tops he crafted out of some metal shelves the school was going to throw away. He sells them at flea markets. Although you won't see any recycling bins, the people of Tse'ii'ahi are expert recyclers. "Any time someone has clothes they don't want or toys their children don't play with any more," said Kalleco, "they bring them to the chapter house or the senior center in case someone else can use them. They always disappear."